Our story of the amazingly swift rise of the Persian empire doesn't begin until around 550 BC. But long, long before that, civilisations and cultures had risen and fallen in the territory of the modern nation of Iran. The oldest culture we know of in Iran - the Elamites - flourished from around 8000 years ago; as old as the world's oldest civilisation (in nearby Sumer - southern Iraq today). Their main centres were Anshan in the southwest Zagros mountains, and Susa (Shush) on the plain in what's now known as Khuzistan (Khuzestan), Susiana or Ilam. 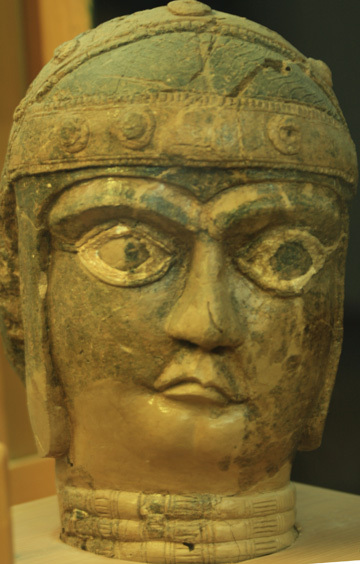 Clay portrait head from Haft Tepe. Around 1200 BC. Susa museum, photo AMW. The Elamites were not Iranians, nor were they Semitic. They spoke a language of their own, completely unrelated to the later languages of the Iranian peoples, or indeed to any other known language ("as distant from Akkadian as Chinese is from English"). Their racial connections cannot be known for sure - but they were not related to the Medes, Persians and other Iranian peoples who started to arrive on the Iranian plateau later, from about 1000 BC. They did, though, occupy much of the territory where Iranians later came to dominate, and their culture and art had an influence on later developments in the Persian empire. A very ancient city-based civilisation had existed in what is now south-west Iran since at least 4000 BC, centred around Susa on the plain and Anshan in the Zagros mountains to the east. 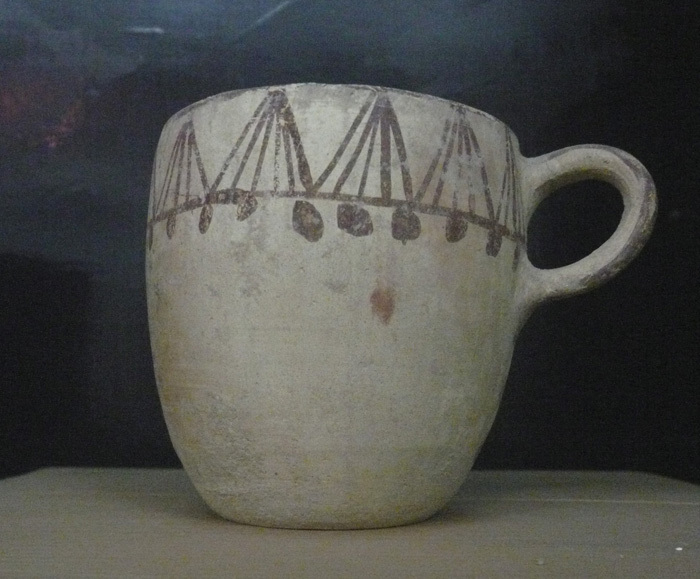 A decent guess is that it was connected with the Sumerian culture, whose earliest pottery finds are from Susa. By 3000 BC, the Elamite language was being written down in cuneiform script. 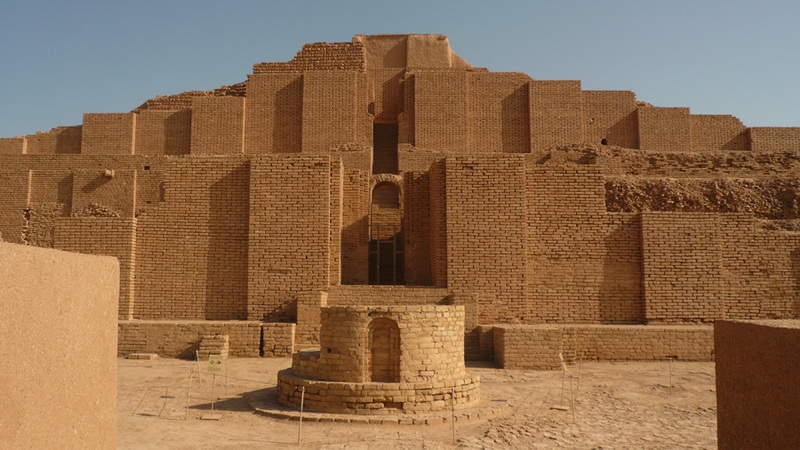 Between 1300 and 1200 BC, they were building ziggurats like Choga Zanbil, and controlling an extensive trading network reaching far to the east. I, Untash Naparisha, have built a temple of golden-coloured brick, silver-coloured brick, stone of ..., black opal stone and white stone of the area and have dedicated this holy area to the gods Inshushinak and Naparisha. May the curse of Inshushinak, Naparisha and Kiririsha fall on the person who destroys, harms or moves its ... stones or bricks and may his descendants be removed from underneath the sun. In a month I levelled the whole of Elam. I deprived its fields of the sound of human voices, the tread of cattle and sheep, the refrain of joyous animals. Elam never really recovered and had been conquered again by the Medes when they crushed the Assyrians (around 605 BC). 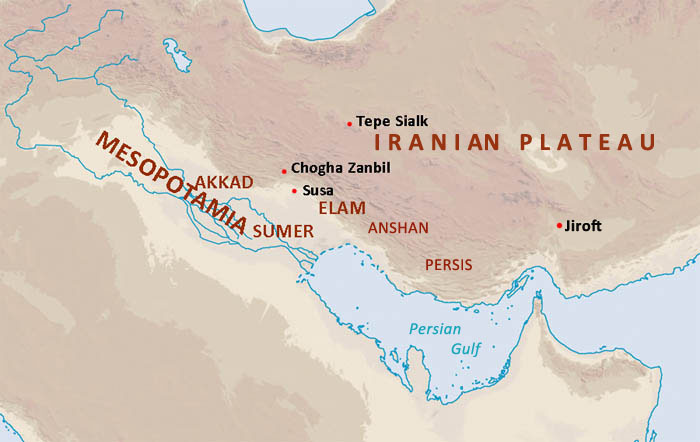 In the southeastern part of Elam in the Zagros mountains, a small kingdom had developed under the rule of the "Persian" Teispes around 650 BC (as recorded on the Cyrus cylinder). In the Babylonian texts it is called Anshan. When the Medes were conquered by Cyrus, the ancient Elamite capital at Susa also became Persian. Tepe Sialk- a mysterious mound near Kashan, where human remains from 3,500 BC have been discovered. It may have been the site of a ziggurat. 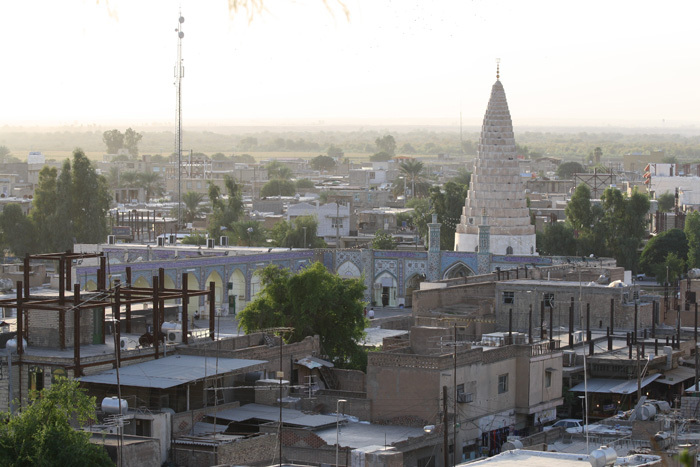 Jiroft- a wealthy trading centre on the route to the east. The Iranians who had been infiltrating the Anshan region since the end of the 2nd millennium had by this time (7th century BC) assimilated with the Elamites and established an identity as Persians - Teispes and his successors were Persian kings of Anshan, part of the land of Elam. So inter-connected were the two peoples by now, that it's rather pointless trying to separate them. The Elamite culture persisted, and the language continued to be written and used for administration throughout the Persian empire. The oldest text on the Bisitun inscription of Darius is in Elamite. Cyrus' own name is Elamite - and it's been suggested that the Persian empire should properly be called the Elamite empire! Were perhaps themselves immigrants from Central Asia - arriving around 5000 BC. From around 2500 they began to record mythical accounts of their history, including Gilgamesh, who became the hero of a Sumerian epic (dated around 2100 BC) - and later of the Semitic (Akkadian/Babylonian) masterpiece. It hints at conflict between his city of Uruk (Erech) and Elam. Their ingenious pictographic writing system (borrowed by the early Egyptians) had developed into a phonetic system by 4000 BC. The Elamites, with their territory in Khuzistan and the southern Zagros mountains (Susa and Anshan) were serious contenders for control of Mesopotamia (Iraq) at times during their long history. Eventually Anshan and then Susa passed to the Persians. The Elamites looted a copy of the Code of Hammurabi - the earliest written list of laws (c1772 BC)- and one of the world's oldest deciphered writings. 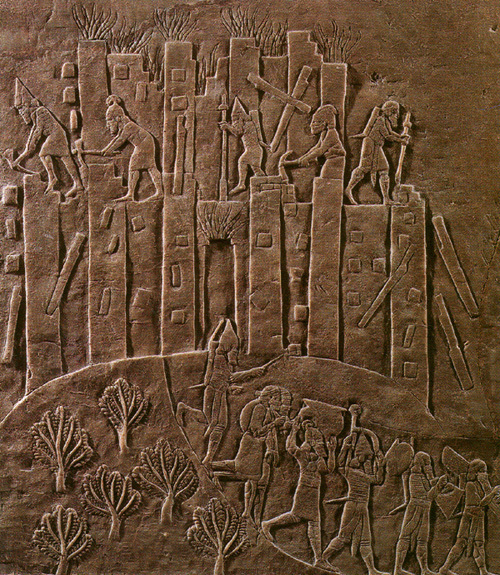 As it was found in Susa, it must have been booty from an Elamite capture of Babylon. More on Babylonians here.